Well you did and it worked!!! RTFM as Nick used to say. Read The F%&*£$G Manual!!!! As he's your cousin too you'll know what the missing letters are!!!! 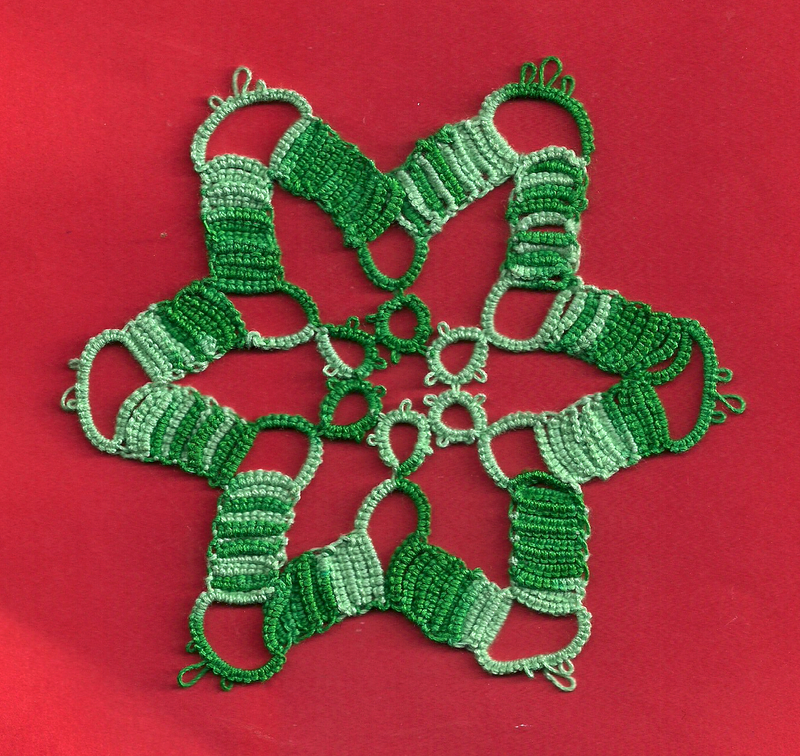 Martha Ess and your sister both have wonderful tutorials on block tatting. Your snowflake looks good. A 'challenge' is usually done mostly to introduce yourself to something new, so don't worry if it's not perfect the first few times. Better thread would give you nicer-looking results, too. Quite impressive snowflake - you did well. "Old and Ropey"- love it! But this pattern is not, I think it is lovely. I seem to somehow always manage to get block tatting upside down - which of course, is very noticeable to anyone who tats. At our tatting meeting last Saturday, on our Show and Tell table, was a large selection of the snowflakes from this book, all done in pristine white. The tatter said she had gone through the whole book, just as you are doing and it's a lovely collection. 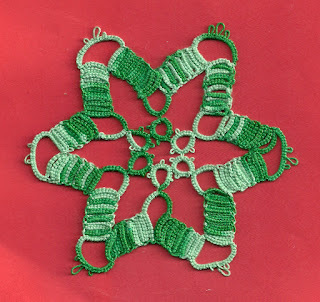 She had made some in size 40 - they're very delicate and beautiful in smaller threads too. Sally, Just think your 1/3 of the way through the book. I'm thankful I don't have a sister who tats :). Your block tatting looks way better than mine, it might seem and look very easy for some, but I struggle with it. I thing yours looks great! Looks fine to me! And I'm glad the thread was rescued from the box. It's a good Christmas color!